Write content for research project web-site. 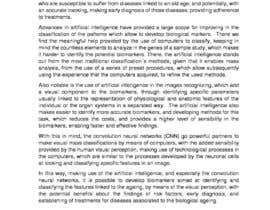 The project is aimed at developing visual biomarkers for age prediction using artificial intelligence and convolution neural networks (CNN). The text shout be catching and modern, maybe somehow blog-style. Provide several variants for these ideas - all in all not less than 400 words. Hi, it is a pleasure to meet you. I just published my entry and i hope that my work can live up to your expectations and this will be the beginning of many projects together. The content of my text covers all the topics, with an outstanding research. I wish to hear your comments. Have a nice day.